Hello lovies and welcome to another sunny Monday! Did anyone watch the MTV Movie Awards last night? I couldn't deal with it and the overload of Jersey Shore-ness. They have attempted to ruin my beloved Shore and I have some negative feelings about that! And, while I love reality tv with the best of them, I just can't handle all those reality "stars" in one place.... it gives me anxiety! However, the ladies of The Hills all looked fabulous in different lengths and styles of dresses! I am even loving ShePratt's neon number! 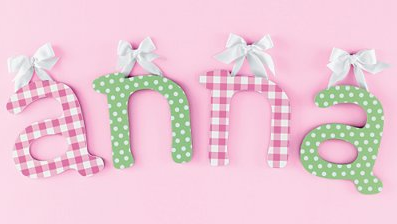 You must pop over to Pink and Green Scene and check out these adorable and preppy hanging letters! How adorable are these! Make sure to tell all your friends to check us out and become a follower! And don't forget to sign up for our giveaway, happening this week!